Do some academics look down on other academics as well as non-academics? Luckily, I have not personally experienced any aggressive or arrogant behavior at the universities I have attended in the US or Australia. My professors and colleagues have always been supportive and helpful. But I have seen this behavior at conferences, and I felt extremely bad for the students who had to deal with it. How are you supposed to respond when a jerk in the audience says your research is pointless? 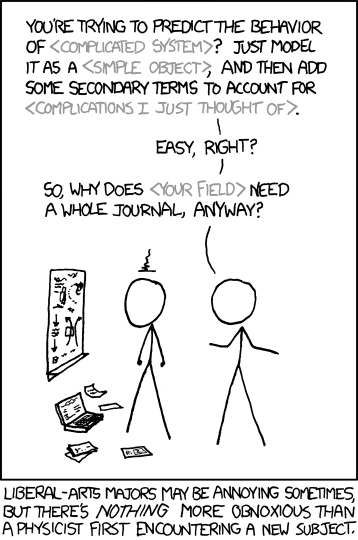 Belittling students and colleagues in front of others in order to feel better about your own research is just awful. Unfortunately, these assholes tend to be perceived as more intelligent than nice people, though it seems to me that people are deliberately arrogant in order to feel superior to everyone else in more than just intelligence. Insecure much? A lot of it is simply bragging – look at me! look at what I can do! look at what I know! – which is incredibly sad considering that academics are supposed to be mature adults and not five year olds. I can understand why she feels that some academics look down on non-academics. There are definitely some Sheldon Coopers in the real world. Academics can seem arrogant when drawing attention to their intelligence, but here’s the thing: academics are more intelligent than non-academics in their chosen fields. I recently posted about my frustration with people who continue spreading myths about linguistics and language learning. It is quite offensive when people who have no professional training in an area that you have been researching for over a decade act as if they know more than you. It is also frustrating when people believe things that have been proven wrong by research for no reason other than they “just do.” When I ask teachers who use the Direct Method why they choose to do so when data show that banning the first language is not beneficial to learning a second language, many are unaware of the research which proves its inefficacy or choose not to abandon it because using the target language 100% of the time “seems” like a better idea, regardless of what the research says. Maybe it is our fault for not popularizing our research more, but what can we do when people refuse to believe our data or change their behavior to incorporate the facts? Asking what people’s opinions are based on should not be interpreted as academics asserting their superiority, or just plain being assholes. We hope that your opinions will be informed by empirical data, because if not, what exactly are they based on? You can have personal views and tell anecdotes about your experiences, but when you believe things that are not supported by research, of course we want to know why. One person’s opinion is in a separate domain from scientific research, where the conclusions are peer-reviewed, many experiments have been done, and the results can be replicated. So yes, we get quite upset when someone says “I smoked for 20 years and never got sick so smoking doesn’t cause cancer” because years upon years of research involving thousands of people proves that it does cause cancer for some people. Just because something didn’t happen to you, or something didn’t work for you, doesn’t mean you can make a broad generalization for all other people. It is true that there is far more that we don’t know than what we do, and that is exactly why we need science. Yet the first sentence epitomizes how misunderstood science really is (especially in the US!). People don’t trust scientists because their results and conclusions are constantly changing, and yes, contradictory. But that is science: the facts must change with the evidence. I don’t know why people are so uncomfortable with this. Granted, there are other reasons why people disregard research in addition to its changing nature. In the case of using the Direct Method, it is easier to teach languages and more profitable to write textbooks in this way, so even with all the evidence against it, teachers and publishers are less likely to do anything differently. I hope everyone can see what an enormous insult to researchers this line of thinking is. To me, disregarding research because it is the easy or profitable thing to do is far more arrogant than what researchers have been accused of. I am often defensive about the importance of research and academia, mostly because of how much higher education is attacked by right-wingers in the US. I am not trying to brag about how smart I am or make others feel like they are inferior because they are not researchers. I’m just trying to share linguistic research since it’s a shame that so much of it can only be found in journals that are ridiculously expensive (embrace open access, academia! ), and since some of the research that makes its way into the popular press only tells one side of the story. If I come across as arrogant online, I apologize for that – but I will not apologize for trying to teach people the beauty of science. Have any students experienced aggressive and arrogant behavior by colleagues (or even other students)? For those not in academia, how do you feel about academics and researchers? This entry was posted in PhD Research and tagged academia on March 12, 2013 by Dr. Jennifer Wagner.